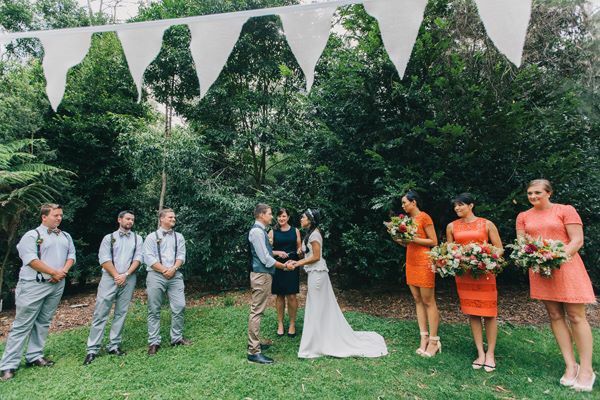 Sharina and Andy had their wedding on the Brittle Gum Lawn at Australian National Botanic Gardens. We were so lucky on the day as we were all set up ready to go and a light rain shower came over, then cleared up for the ceremony. 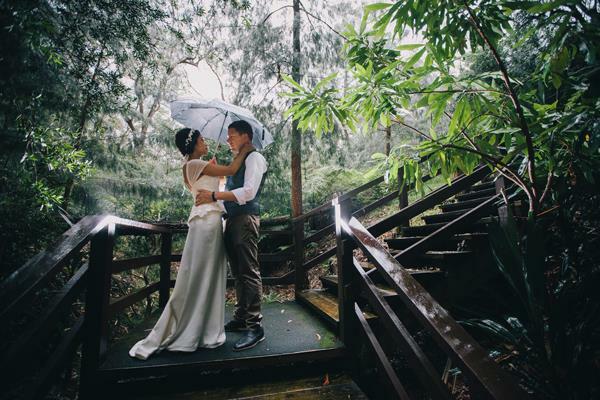 While the bridal party was out getting photos the heavens opened and poured down but it was only for a short while and created some beautiful images with the rain forest back drop being a bit damp. 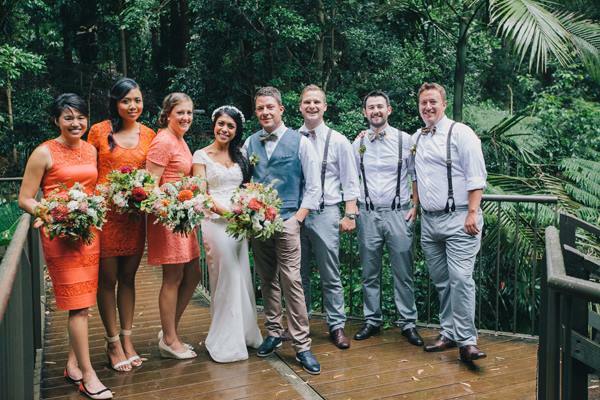 Sharina’s ivory dress was Fara Almasi from Keepsake the label. The bridesmaids looked stunning in orange dresses from Miss Selfridge, Warehouse that popped against the green canopy of ceremony venue. Andy was looking very dapper in tan pants, white shirt and a Ted Baker Wasitcoat, Etsy Bow Tie and shoe from House of Fraser. Groomsmen had grey pants, white shirts and also had fabulous leather braces from Suspender.com and the bow ties came from the tie bar. 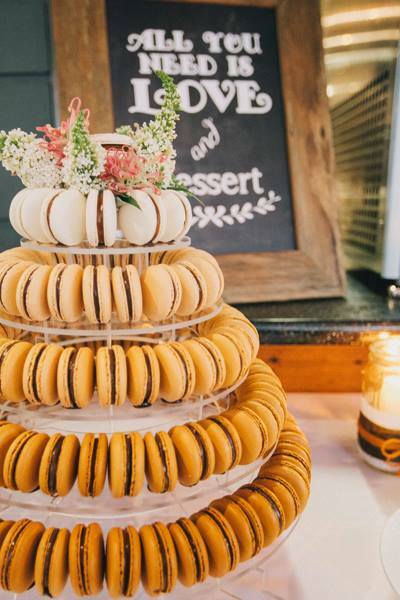 Cake was by Tania Cake Designz and the Macaron Tower by Makmak Macarons in Sydney. 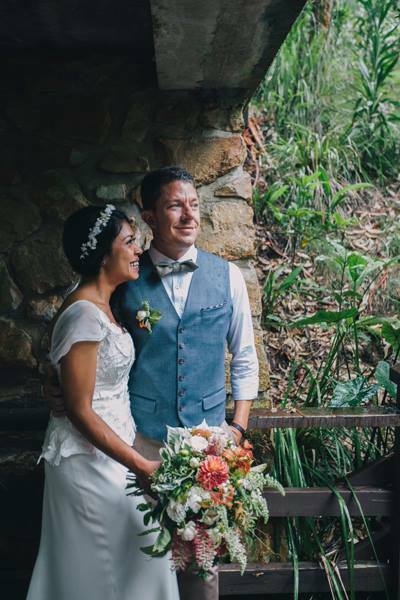 All Sharina and Andy’s stunning images are thanks to Dane Adkins Photography. All the flowers arrangements are from Laurel and Lace. Their reception was held at Floresco in the Garden that is on the grounds and was only a short walk from their ceremony. 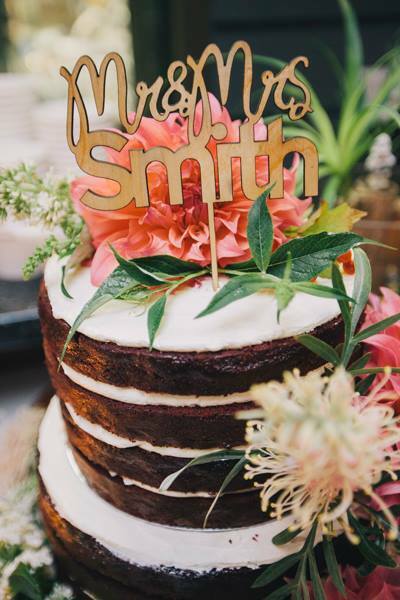 It has a relaxed feel, flexibility with decorating (either DIY or Jo the event’s manager can assist with other ideas and suppliers). It also has the deck area that can be utilised as a dance floor or more seating for guest. Amanda, was very easy to work with, she had taken on board our suggestions and customised our ceremony to make it so unique and memorable. She is also very experienced and provided suggestions to ensure that our ceremony was as smooth sailing as possible. Couldn’t have asked for a better celebrant.